Do You Tip a Dog Groomer Who Owns the Business? Rules for tipping vary from industry to industry. Tips offered to the barista who makes your coffee, for example, may not match up to the tips you would give a server or hair stylist. When it comes to dog grooming, tipping is "traditionally" a thing a customer does, though exceptions exist. It all depends on your groomer, the business and your happiness with the work. With food service, a 15 percent tip is still standard, 20 percent normally considered a good tip. But a standard percentage for services like dog grooming are harder to find. Groomers who don't work for themselves generally do not make the full price of the groom back in compensation, so a small tip of a few bucks is a nice way to show your appreciation for the work. An extra $5 on a $50 cut, though the percentage seems smaller, is not a bad tip. Think of it this way: $3 to $5 is an okay tip, while $10 on a $50 cut would indicate your appreciation for exceptional work or for accommodating your preferences and your dog's special needs. A tip of 15 percent is a solid standard for grooming services. It is easy to dismiss the issue of tipping if the groomer in question happens to own the facility. Since he or she theoretically receives all the profits generated by the shop, it can seem unnecessary to tip. But go ahead. Tipping is a measure of showing your satisfaction with the work performed, and owners should not be separated from other groomers. If you like the work done, tipping the owner is perfectly acceptable. And, tipping can help ensure your groomer wants your business and makes efforts to accommodate you in her schedule. Tipping the owner's not necessary if the owner didn't groom your dog. In some circumstances it is perfectly acceptable to skip the tip. If a business states that groomers do not accept tips, the owner will abide by the rule. Additionally, if you are trading something for the service or have another deal worked out with the groomer/owner, it may be okay to hold back on tipping. Tips are for traditional purchase of a service at a location that allows employees to accept tips. If you use the same groomer several times a month, you may want to consider a holiday bonus in addition to your normal tips. How much you give is up to you, but it is not uncommon for hair stylists, dog walkers, groomers, maids and other service professionals to receive holiday bonuses from their clients. Big picture: Whether or not you offer a bonus, or you tip at all, is entirely up to you; but greasing the wheels never hurts anything but your change purse. 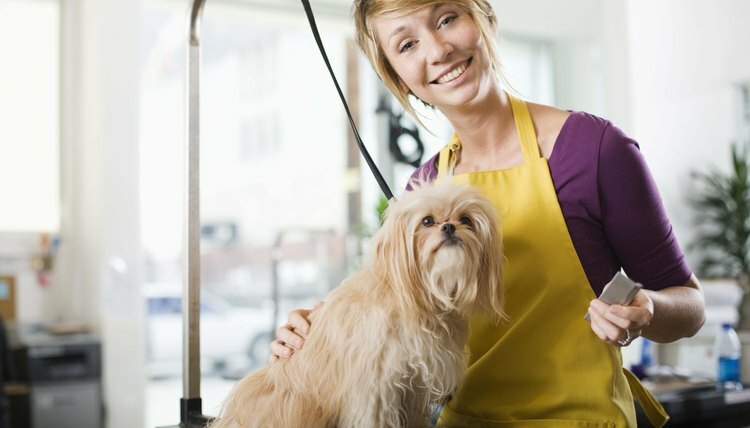 Dog Groomer Advice: Do People Tip Their Dog Groomer? Dog Time: Dear Labby: Tip the Groomer?